In a country where mental health is seen as taboo and stigma thrives in a culture of silence, one woman set out to change this exactly three years ago. Award-winning founder, Hauwa Ojeifo who was at that time recently diagnosed with bipolar and posttraumatic stress disorder, and had a near suicide attempt barely 2 months before, set out to change the face of mental health in Nigeria by boldly speaking her truth publicly. She founded She Writes Woman on April 17, 2016. For three years, She Writes Woman’s mission has been to lead a movement of love, hope and support that gives mental health a voice in Nigeria. She Writes Woman pursues this mission by taking back the misinformed narrative around mental health by telling new stories, connecting help with hope and normalizing mental health conversations by providing safe places where people can talk without fear or shame. Utilising education and awareness, advocacy and policy influence coupled with innovative and sustainable solutions, She Writes Woman’s mission is simple - to create better lives for Nigerians by improving the way they think, feel and behave. Over the past 3 years, She Writes Woman has initiated a 24/7 mental health helpline averting over 50 likely suicides and counting, and sustained the only women-only mental health support group with over 39 editions directly supporting over 600 women and girls across 4 states in Nigeria. The leading mental health movement in Nigeria has also reached over 500,000 people globally with information and knowledge that will change their attitude and behaviour towards mental health, and recently created Safe Place Nigeria; a first-ever preventative mental health life clinic for young people to address life issues such as stress, relationships, fulfillment etc early enough before they become mental health problems, proudly donated by Airtel Nigeria as part of its Airtel Touching Lives CSR Initiative. It is no wonder that amongst the organisations’ many accolades and recognitions include Ojeifo’s prestigious award from Her Majesty the Queen of England at the Buckingham Palace in June 2018, being the only African to be nominated (and won) the MTV Europe Music Generation Change Award in Bilbao, Spain and bagging the AstraZeneca Young Health Scholarship in becoming a One Young World Ambassador to the Hague, Netherlands. In marking her three-year milestone, She Writes Woman unveils her Mental Health Ambassadors - a group of nine diverse women who are leaders in their industries and are passionate about mental health. 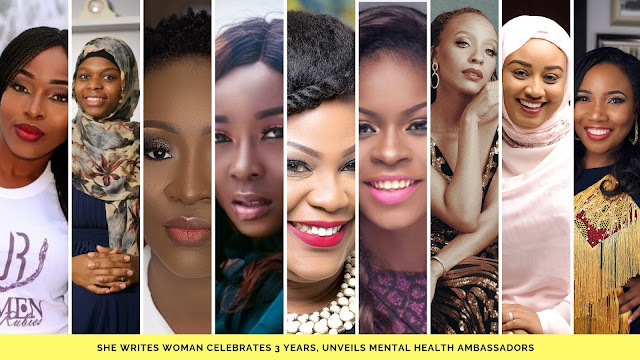 Among these women are Esther Ijewere (Women of Rubies), Gusi Tobby Lordwilliams (Girl Hub Africa), Glory Edozien (Inspired by Glory, 9to5 chick), Olive Emodi (Award-winning OAP), Fatima Zahra Umar (Jaruma Magazine, Divorce Diaries), Adenike Oyetunde (Amputees United Initiative), Laila Johnson-Salami (Multimedia Journalist), Wana Udobang (Award-winning Journalist), Zahra Zakariya Abdulkareem (The Umm Fariha Network). “I am so excited to become a part of the inaugural SWW Mental Health Ambassadors. Being able to give a voice to mental health is so important to me as someone that has been clinically diagnosed”, said Laila Johnson-Salami. Speaking on why this is an important position for her, the Jaruma Magazine Chief Editor stated, “I am a survivor of depression...Being that we live in a country that is only just beginning to come to terms with the importance of mental health, I look forward to being part of educating our people on the importance of sound mental health. Lordwilliams also added, “I look forward to representing all that She Writes Woman stands for, getting more people to be aware of its mission, uphold her core values and increasing our reach this year and beyond”. Stella read that ur caption again wether e make sense. Yaayyyyy. Wana is here baby.